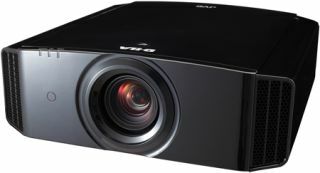 CEDIA EXPO 2011: JVC introduces three 4K projectors | What Hi-Fi? Just hours after Sony announced the world's first 4K home cinema projector - as we reported last night - JVC has joined the 4K party with three new consumer models supporting resolutions of up to 3480x2160. The DLA-X90R, DLA-X70R and DLA-X30 projectors all use D-ILA projector technology, are 3D capable and boast a host of new features, including: reduced crosstalk and brighter 3D images; parallax adjustment so you can choose the degree of 3D you like; anamorphic lens support, and a built-in 2D-3D converter based on JVC's $30K pro converter. The flagship DLA-X90R model comes with 3D glasses and transmitter as standard, plus a three-year warranty. It offers a claimed contrast ratio of 120,000:1. That's a signifcantly lower figure than the million-to-one dynamic contrast claimed for the new Sony 4K design, but JVC claims: "our figures indicate the intrinsic ability of the projector to show contrast simultaneously, not dynamic iris figures to artificially inflate contrast ratios". `As ever with contrast ratio claims, the proof will be in the viewing. Both the DLA-X90R and the DLA-X70R are THX 3D Certified, and use JVC's advanced e-Shift technology - originally designed for its even-higher resolution Super Hi-Vision projector - to upscale Full HD images to 4K. The DLA-X70R has a claimed 80,000:1 contrast ratio and a two-year warranty; the 3D glasses/transmitter are optional with this model. The entry-level 4K model is the DLA-X30, which has a claimed 50,000:1 contrast ratio; again, 3D is optional here. JVC has also made a new design of 3D glasses available to users of these new and its existing 3D projectors. The new PK-AG2 active-shutter glasses are lighter and more compact than the original, PK-AG1 design, and are also rechargeable. The 'AG1 glasses will remain available, as their larger design is better suited for users whom already wear specs. The JVC DLA-X90R, DLA-X70R and DLA-X30 will ship here in the US in November, priced $11,999, $7999 and $3499 respectively. We hope to review the new 4K JVC projectors - plus bring you UK prices - as soon as possible.